Is a campervan the best way to chase the aurora in Iceland? Back in 2017 a friend and I packed our cameras, hired a CampEasy campervan and hit up the classic photography locations of Iceland’s southern coast. From Snaefellsness to Hofn and back to Reykjavik, we slept under the stars and northern lights and woke up next to glaciers, beaches, mountains and volcanoes. We were constantly at the helm of the rugged weather but at one with the landscape and the freedom to relocate was so liberating. It was so good, I wanted to do it again. A key criticism has been that camper vans bring with them unhygienic waste, as they are not equipped with toilets. Most spots where travellers have been stopping their vans along roads lack public toilets. By banning camper vans from spending the night at spots other than designated campsites the authorities hope to eliminate toilet paper and human waste from rest stops and the road. Was the trip about to become way more expensive than I had budgeted for? How much was this going to restrict my freedom to move around and chase clear skies? The experience I had with CampEasy in 2017 was perfect. Super friendly customer service, a well-established company and absolutely no hitches. We’d heard stories of other companies trying to charge people for damages they hadn’t caused and some that didn’t have the network and infrastructure across the country to cover remote breakdowns and repairs, however, nothing I can vouch for personally. We put our faith into the online reviews of CampEasy and enjoyed such a seamless trip that I didn’t hesitate to book with them again. As we were on a tight budget we opted for their smaller vehicle, the Easy Small (Nizzan NV200). They come fully fitted with a sink and running water, pots, pans, cutlery, gas stove, fridge, and two big leisure batteries so you can keep the lights on and charge your electronic devices without fear of running down the vehicle’s starter battery. 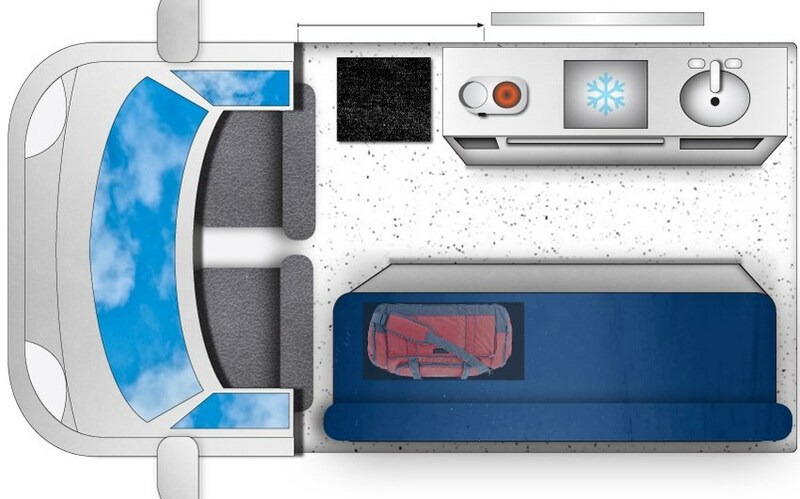 They also provide bedding and of course it would be impossible to survive the harsh winter temperatures without the fitted Webasto diesel heaters. You can leave these running all night and barely notice a decrease in the fuel tank - toasty! One of the newer additions that they provide all vehicles is a tablet device loaded with some really useful stuff. They can be used as a WiFi hotspot so you can connect your phone, tablet or laptop to the internet and the app they run also provides you with the latest weather and road information, information that you simply cannot ignore if you want to drive around Iceland. I was also super impressed with the ‘Nearby’ tab that brought up all the nearby attractions which came in super handy when we found ourselves in an unfamiliar area, chasing clear skies trying to capture the aurora borealis with an interesting foreground. There’s also a handy map of all the campsites open in winter including details on their price and available facilities etc. I’d advise any itinerary to be planned quite loosely as the Icelandic weather typically has its own ideas. Rather then dash straight for the north we hung around the Snaefellsness peninsula in the west as it seemed to be the only hope for any clear skies for the first couple of nights (I used a combination of the Icelandic Met Office and Windy to assess weather). We spent the day in and around Arnarstapi, probably one of the only areas I was looking forward to revisiting. Sadly clouds forced us to take a 2-hour trip back from where we came only to find a menacing patch of cloud just above Hraunfossar waterfall, so I hit the ‘Nearby’ tab on the CampEasy tablet and found a quaint little church just a few kilometres away. We arrived just in time for the first geomagnetic sub-storm of the trip and the skies ignited with dancing aurora. We headed to the nearest winter camping site, paid up in the morning and headed back to Arnarstapi in hope of catching the aurora there. Clouds once again forced us east and after a frustrating stop at a rather busy Budir church we returned to a hot spring we’d visited before. It’s been a bit of a dream of mine to enjoy the northern lights from a natural hot spring but typically I’m prioritising the photography. Not this night though. And boy did it live up to the expectation. This was quite possibly the most content I have ever felt in life. Sigur Ros was playing, the water temperature was that of a nice warm bath and an arc of aurora fluctuated all night into pillars and ribbons of different colour and brightness. What a dream. That night we noticed the diesel heater wasn’t working. CampEasy provided some good troubleshooting over the phone despite the late time but unfortunately it wasn’t going to be a simple fix. They advised is to sleep comfortably with the engine running and heaters on and that they would get us in to the nearest garage in the morning. However, I was desperate to get back on the road as quick as possible as the weather was now shifting in favour of the north coast, so we drove to Reykjavik that night so that we were ready to pop into CampEasy in the morning. The van went into the garage, we sat down for a coffee and by the time we were finishing them, they came to tell us that the heater wasn’t going to be a quick fix so they put a new one in. We were back on the road in about 30 minutes total. Boom. Hvitserkur was the one location on my list I expected to be a bit busy so was quite surprised to enjoy the place in solitude and equally overjoyed that the cloud faded as the aurora erupted. We continued chasing the lights at a canyon we found through the Nearby option on the tablet. From there we headed east through Akureyri and towards the Myvatn geothermal area. It was instantly clear we’d be spending more than one night here. As the south was being hit with high winds and stormy weather we were enjoying crisp clear skies at the price of rapidly dropping temperatures overnight. The first night apparently dropped to -25 degrees and I experienced my first light pillars. The calm weather gave way to an impressive mirror surfaced lake with a rapidly changing shoreline and the area was scattered with lava fields, craters, and geothermally active areas. The ground was breathing and the waters bubbling. We couldn’t help but spend a few nights here. Campervan - £567 between 2 people for 8 nights. Prices are cheaper in the winter off-season, working out as £35 per person per night. As you can see it makes things a lot cheaper with two people. Another way we saved money was to take our own dehydrated meals. Food in Iceland, especially in restaurants, can be quite expensive. For example, a medium pizza with a beer can set you back £30-40! A dehydrated meal on the other hand costs about £7 and also saves you time and money in preparing and washing up. This meant we could spent the day scouting and exploring up until sunset, grab a quick meal and get straight back on the road to chase the aurora. Another awesome money saver that’s definitely worth mentioning is the leftover stuff available at CampEasy’s HQ. People who still have food left at the end of their trip leave their non perished foods on the shelves for others to grab freely before they embark on their adventures. We grabbed toilet and kitchen roll, coffee, sugar, sauces and other condiments and of course left a bunch of stuff on the way out. You gotta appreciate wonderful things like this that minimise waste. I guess the only other approach to enjoying a short trip to Iceland with such flexibility is to hire a car and book accommodation as you go. A car for 8 nights ranges from £175-400 (versus £567 for a campervan) but the average rate for a nights accommodation for two is around £100-300, adding £800-2400 to the trip (versus the extra £120 for campsites with the campervan). You could potentially save some accommodation cost by using hostels, however, outside of Reykjavik they are pretty sparse. You also run the risk of limited accommodation available due to booking last minute. Booking in advance would save you the disaster and maybe some cash too but you will be much less flexible when it comes to weather. If you have to drive a long distance to find clear skies, you’ll have to double the distance given the need to return home. Everyone has their own budgets and comfort levels but if you ask me, there’s no better way to enjoy Iceland than in a campervan, regardless of the good value.